You know that I love doing my nails, it is perhaps my favorite of all beauty rituals. 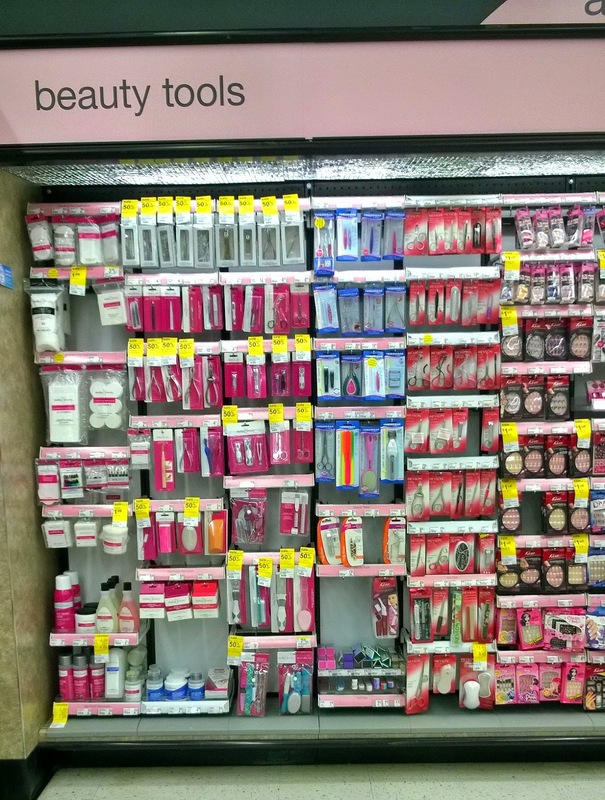 I also love sharing any makeup tips or products with all of you, especially when I find something really good. But as much as I love nail polish and sharing all the new polishes and colors, I have never shared a nail art tutorial because I am just not talented enough for it. Have you seen the nail art that is shared on Instagram? Some of that stuff is so amazing and I always wonder how these girls find the time or talent to do such major works of art on their nails. Well today I decided that it was time to step out of my comfort zone and come up with a cute and very simple nail art look that even those of us who are "nail art" challenged can master. I went back to look at my two Walgreens hauls from this past weekend where I scored Revlon for 40% off and Maybelline ColorShow polishes for $1.99 a piece and then I hit YouTube to find something I could do with NO nail art tools. Using the Studio35 Beauty Nail Polish Remover and two of three of the polishes that I purchased at Walgreens, I set about to trying out a simple tutorial I found online. I am using Maybelline Color Show polishes in Coral Crush and Hibiscus Haven. I love coral polish and the hibiscus made a great match to create a perfect summer look. Step 1: paint your nail in whatever solid color you have picked out. I used two coats for my solid base. Step 2: Using the toothpick with the tip cut off add a nice dollop of your polka dot color to the tip and starting in the middle, place a dot on your nail. Then add two more on the bottom and the top. Step 3: Now you can carefully dot the sides placing them in the spaces in between the other dots. As you can see my dots are not all perfectly round or even. 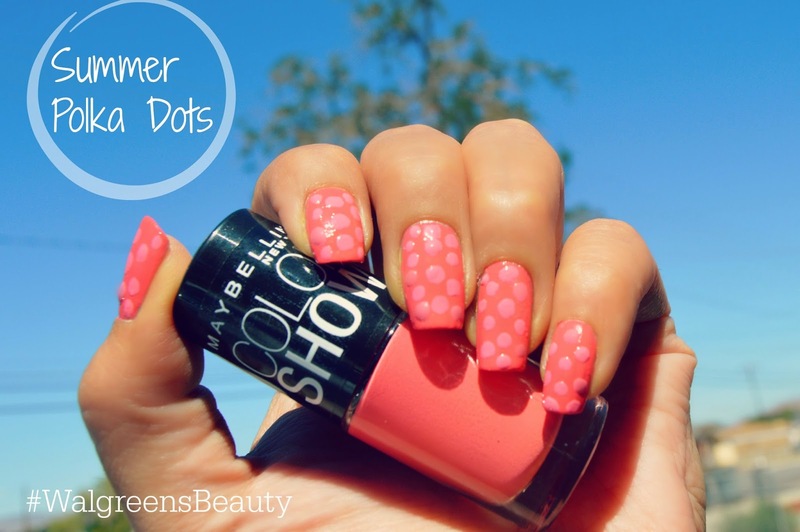 These are things that can be perfect with time and by purchasing an actual dotting tool. I also added too much polish to some of the dots and those took extra time drying, but again that is something that you perfect with practice. What do you think? Personally, I think it's super cute and even though it is incredibly simple, it is still so different from my every day solid color. There you have it my friends, a summer nail art look for dummies! Don't forget that to you can pick up Maybelline Color Show polishes for $1.99 this week at Walgreens and if you need more incentive to go, check out the gift With Purchase offer which runs between 6/29 - 8/30 and allows consumers to get a coupon by texting a code or visiting http://www.walgreens.com/summerbeautygwp for a FREE travel-size make-up brush set, their gift with any $20 beauty and personal care purchase (excluding baby category). Love polish? Run to Walgreens and go get you some!